Today has been another good day. Doc spent most of the day sitting up in the chair. He continues to have improvement on his hands and feet. They were able to cut his pain medicine in half since he is doing so much better. He still continues to need platelets daily. This is very common since they give more chemo and other medicine then he has had in the past to get him ready for the transplant. As before it takes a couple of weeks before the effects from the chemo begin to wear off. His other labs have improved, but his neutrophils haven't begun to go back up yet. The nurse last night said that with the dose they give here it takes a little longer for that to go back up. This time it is very important for that to happen. As I said before that is the first sign that the transplant took. We continue to pray that will happen with no rejection problems. We found out today that this hospital does perform miracles! Elvis was in the house!! 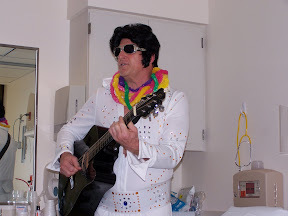 We had a visit today from Elvis. He even sang a couple of songs for us. He was very good. I took a couple of pictures.